HIV-Positive Organ Transplants Set To Begin At Johns Hopkins : Shots - Health News Doctors say organ transplants from HIV-positive donors to HIV-positive recipients will save lives and shorten wait times for everyone. NPR spoke with one doctor who helped end the 25-year ban. Doctors sew a kidney into a recipient patient during a kidney transplant at Johns Hopkins Hospital in 2012 in Baltimore, Md. 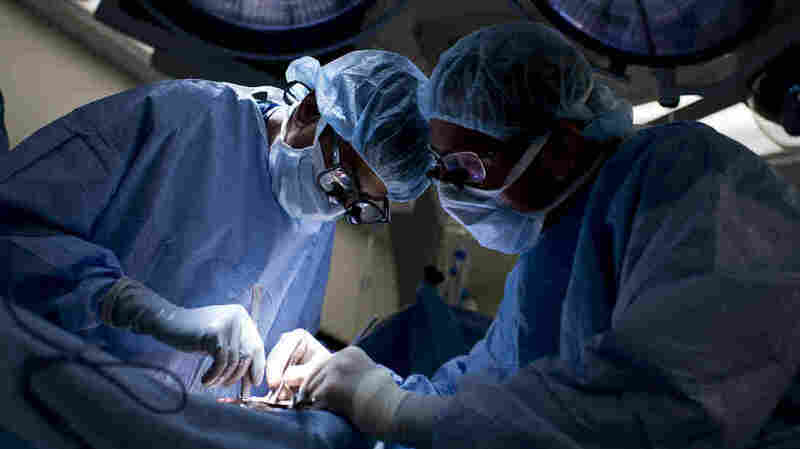 NPR's Michel Martin spoke with Dr. Dorry Segev, an associate professor of surgery at the Johns Hopkins School of Medicine, who has worked for years to allow these kinds of organ transplants. About five or six years ago, we were really ramping up, both at our center and nationally, transplanting patients with HIV. So HIV had totally changed as a disease from basically a death sentence in the '80s to now something that's a chronic disease, people live their lives with it. They just need to take antiretroviral medication. We're seeing now kidney failure, liver failure and the need for transplantation in these patients. As we were ramping up, we're putting more and more people on a waiting list. Now, as you know, the waiting list has about 120,000 people on it, so that's kind of a depressing line to wait in. And at the same time it occurred to me that we were throwing away organs that were infected with HIV, that could be used to help people with HIV — because of this antiquated law. So it occurred to me, living 30 minutes north of Capitol Hill, that maybe we should do something about this. The first thing we did was estimate what the impact would be of a law like this. So we did a study to try to estimate how many potential HIV-positive deceased donors there would be. And it turns out that it's about 500 per year. So if you think about 500 donors per year — deceased donors — that's over 1,000 organs, so that's over 1,000 lives saved. And if that were to happen it would be the biggest increase in transplantation that we've seen in the last decade. When we thought about it that way, we thought: This is highly impactful. And so we published this, we got some media attention for it. And then we got groups from the HIV community, the transplant community, the medical community, patient advocacy groups — they all joined us in our effort. We wrote a bill that would become the HOPE Act, the HIV Organ Policy Equity Act, and started to do what they taught us on Schoolhouse Rock. This was kind of a quirk of timing. The big congressional law that oversees organ transplantation in the United States that really organized our transplant system came about in the mid-'80s. And the mid-'80s happened to be the AIDS scare and at that time AIDS was basically a death sentence. So it was written into that law at the congressional level — not the policy level, but the statute level — that we can't use organs infected with HIV. And so that stood during the entire AIDS scare. The plan is HIV-positive organs can go into HIV-positive patients. And then we would be selective about who the right donors are, who the right recipients are and how we can properly match them so that somebody doesn't get, for example, a much more aggressive strain of HIV. We think that superinfection is a reality and is something we're going to have to deal with. But if you think about it, if you have a pretty unaggressive strain of HIV and we know that the donor you're getting the organ from was also controlled on the same meds that you're taking, then you will probably remain controlled when you get that organ. Basically it would be just like all the other compatibilities we consider in transplant. Imagine now we take hundreds or maybe thousands of people off of the list, then everybody behind them moves forward. So people with HIV are benefited directly and everybody else on the list is benefited indirectly. And we're all very excited to get started. I'm thrilled that this is possible. I'm thrilled that Congress was receptive to this, that President Obama signed the bill. I'm thrilled that we are now able to do this for people. But I'm most thrilled that now patients with HIV on the waiting list will have a better chance at life.